I didn’t play Prey at the time because it was visually unappealing to me and I’m as shallow as a puddle. While the thought of sneaking and shooting one’s way around a space station ticks many of my boxes, the thought of doing so while fighting the most nondescript aliens you could ever imagine poured doubt on the entire enterprise. The answer is: quite bad. 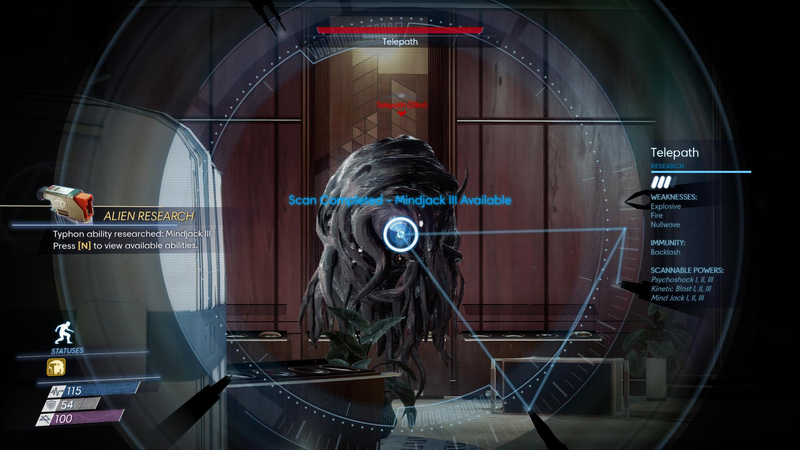 Or, well, not bad per se — Prey is full of good ideas and interesting mechanics and cute vignettes, but there’s nothing remotely compelling to tie it all together. The narrative stutters along without much impetus; you are told fairly early on that your mission is to self-destruct the space station to kill all the murderous escaped aliens. The following hours of toil are you crawling slowly around the station, unlocking its areas door by door by door, trying desperately to reach the arming keys for the bomb. As modern video game plots go it is refreshingly simple, but its delivery is so deadpan that it lacks the impact that a clean and obvious target is supposed to have. I cared in a dispassionate must-clear-all-the-icons way about ending the alien threat, but I didn’t actually care (the way I cared about, say, wiping the smug grins off those Chosen in the aforementioned XCOM2). Flying around outside in zero-gravity is mildly amusing, but you realise how small the station actually is when you can fly end-to-end in about three minutes. The game spends at least half of its time empty of non-hostile life. You follow the last moments of the station’s corpses by listening to their obligatory audio logs and reading their e-mails, trudging between trashed rooms looking for the key cards and codes and passwords that will get you into the next zone. You are initially guided by a robot who offers you sporadic instruction but the rest is not hard to follow, even if you’ll constantly ask yourself why you’re bothering. Into this mix some side quests are injected. Stumbling across an e-mail where somebody mentions a thing can spark a hunt for that thing; frequently, it’s somebody inquiring after somebody else’s health before/during the disaster which gives you a quest to find that person. These quests flash up almost at random and have as little impact as the main plotline; you scout around, find the person who is, yep, definitely dead, nab the swag from their cold dead hands and move on. Sometimes the corpse is already an alien blur, oh no. I get that it’s an attempt to add some kind of structure to a sandbox where there is none, but as they’re introduced by nothing at all there’s no connection and no motivation to actually follow through beyond the vague desire to get that bloody indicator off your screen. The reward is generally swag you’d either have found anyway by being thorough or not even missed if you didn’t. Things come a little more to life when at around the half-way mark you get contact from some actual survivors. The few side quests they give you are a thousand times more engaging because there’s a face and a conversation and a point to doing the thing rather than a hollow pop-up that leads to a hollow pop-up. There are not very many survivors so the excitement that the plot might start moving somewhere interesting is short-lived (I also believe you can murder most, if not all, of these survivors, if you’re that way inclined). What does the scouter say about its power level? I unlocked all the alien powers but never actually bought one in case my pet turrets started detecting me as a villain. The black blob aliens definitely don’t help. Not only are they visually indistinct, they have no meaningful dialogue — no real motivation, no purpose that makes them interesting to follow. They do their thing, which is eventually revealed to be a grand plan on their part, but the player and the survivors are utterly irrelevant to it (even more so when you see the nonsensical post-credits sequence). They’re not even that interesting to fight. The only novel enemy is the game’s poster-child: the mimic, which can morph into a random item of scenery and then jump out at you as you pass by. It’s funny the first couple of times but soon becomes a mere irritation — especially once you get the psychoscope, which can reveal their disguises. They’re not powerful enough to be a threat except in large numbers that rarely occur, and when they’re not a mug they’re a skittering black smear that blends with even minor shadows (your screen also tints black at the edges when you take damage), making fights a bit like trying to swat a fly rather than a tense life-or-death struggle. Just keep swinging the wrench at the blackness, it’ll stop hurting you at some point. The rest of the enemies add very little to the mix. Phantoms are humanoid black smears made from human corpses (so you should feel bad for fighting them? ), with occasional electric or fiery bonuses. Telepaths and Technopaths are flying black smears that control turrets and robots or surviving humans. Sometimes there is the Nightmare, who can one-hit you and is completely prescient no matter how you hide, but it always times out after two-three minutes so you can just find a closet where it can’t fit through the door or hit you with its homing missiles and wait it out. 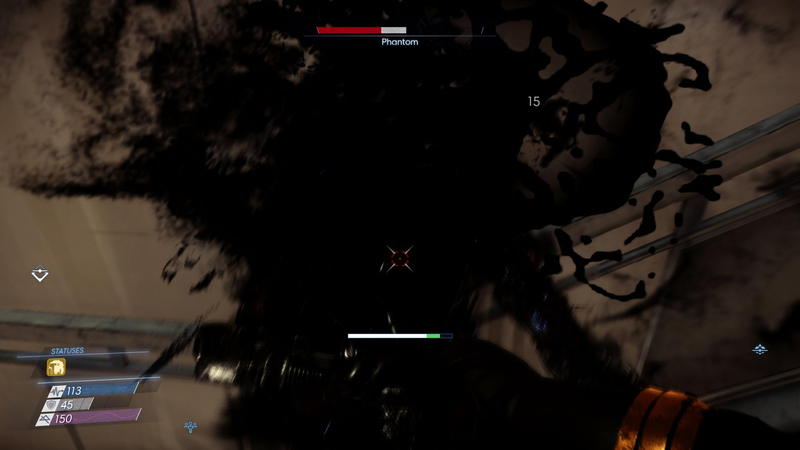 They’re all black smears, though, so there’s nothing visually interesting going on with combat. Splatter them, loot their indistinct giblets, and move on. 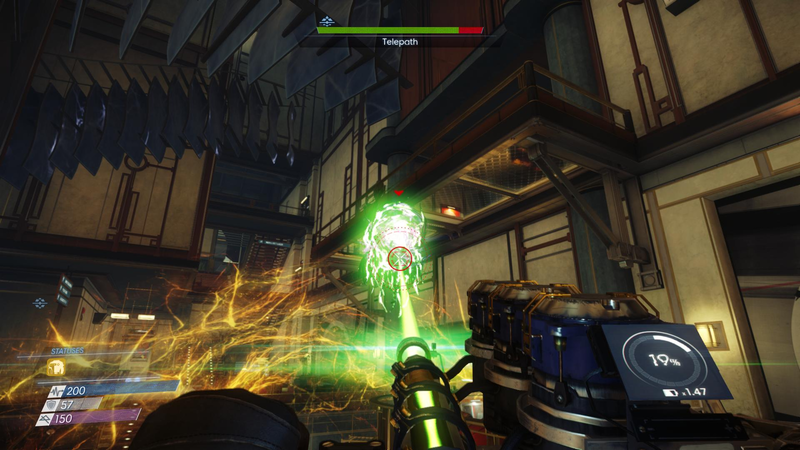 The green laser that makes enemies go green until they explode adds a welcome bit of colour to proceedings. The utility weapons are where some fun starts to creep in. The GLOO gun fires clods of glue that can immobilise enemies, which is good for running in to give them a bash. More importantly, however, it can block up flame jets from damaged pipes and electric arcs from damaged conduits, giving you space to run in and do some more permanent repairs. Its most fun ability, however, is to cling to walls in big clumps to create solid platforms you can use to climb up to out-of-reach places. The thing is that the levels weren’t really all that big enough to make the platform-building aspect particularly meaningful; I ended up needing to do it about twice over the whole game. 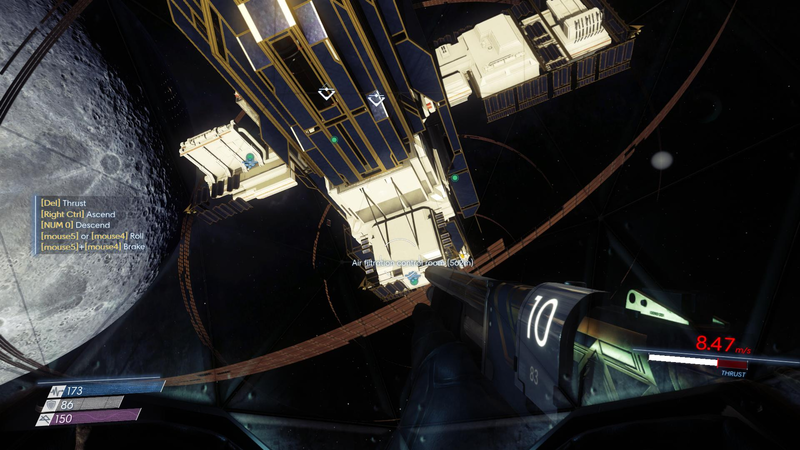 The space station appears cavernous in some places but in reality there are not particularly many secret air vents or alternative routes that can be accessed by platform building (or even other forms of non-standard traversal). 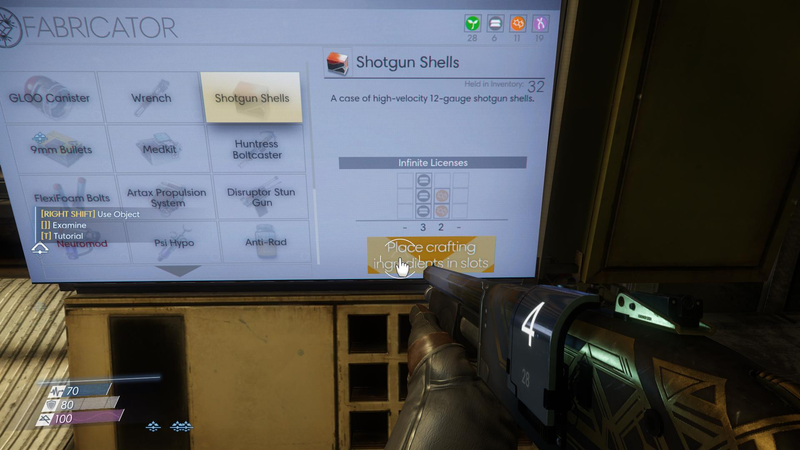 There is also a crossbow that fires foam darts, which can be used to hit switches and touchscreens from a safe distance. Another fun idea, and another thing I only needed to use about once. It does, however, have the turn-the-crosshair-into-the-cursor computer screens of Quake 4. Ultimately it left me completely cold, as predicted. I didn’t buy it at the time because the black blob aliens are perhaps the least inspired creatures I’ve ever seen, and unfortunately good reports of the rest of the game were clearly exaggerated. It does have a few sparks of a fun sneaker/shooter but it comprehensively fails to put them together. Games really aren’t just about mechanics — they need to have compelling stories and settings too. Otherwise, what’s the point? 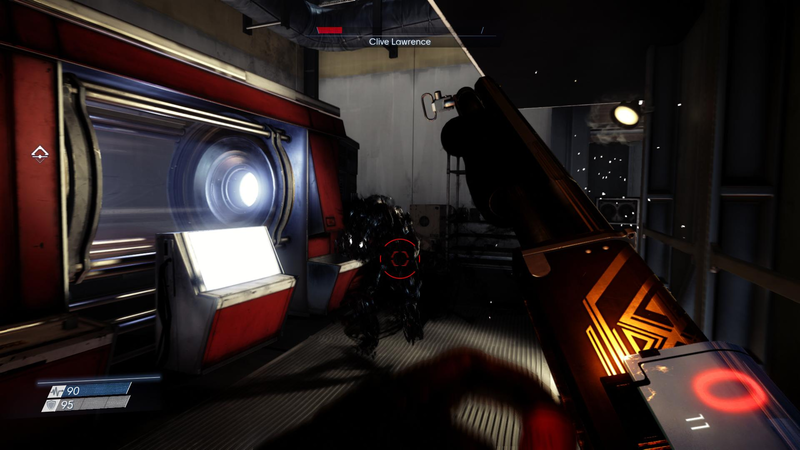 This entry was posted in Gaming and tagged Arkane Studios, FPS, immersive sim, late to the party, Prey by Rao Dao Zao. Bookmark the permalink.